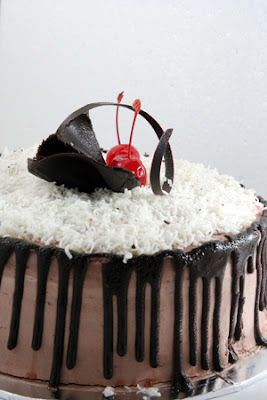 Dripping with goodness : In awe of the deliciously filthy drip cake. It's ludicrously filthy, a scrumptious cake just dripping with delicious ooze.. Who'd have thought that adding a yummy topping, dribbling down the sides of a cake, would make for such a delightfully gorgeous bake! The drip cake has been teasing us with sumptuous images of tasty, rich and glossy bakes, topped off with a delicious layer of dripping ganache or frosting. Who'd have thought that something so simple as adding a dripping layer of topping would make for such a deliciously teasing and scrumptious cake! Everyone has their own take on it, whether you want to add a simple layer of drippy goodness topped with sprinkles, or really go to town and top that layer of filth with even more scrumptiousness from chocolates to whole Kinder Bueno's and Ferrero Rocher, oh my!!! It can be as simple, or as extravagant as you like, but what really makes the cake so special is those drippy layers of goodness to finish the cake off. Whether you fancy a scrumptious chocolatey ganache, like this yummy bake from The cake blog which features a dripping ganache topped with oodles of chocolatey goodness, or something with more of a pop of colour, like one of these yummy neon drip cakes from Delish by Katherine Sabbath. For something that's truly scrumptious, you may want to make sure your sitting down before you behold this yummy salted caramel drip cake by Jane's Patisserie, topped off with plenty of rolos for a deliciously filthy drip cake, yum! However you want to create your drip cake, you can choose to top it with a drippy chocolate ganache, or a colourful frosting. Go nuts, you could even create a multi-coloured rainbow of drips! For that perfect topping, it needs to maintain the appearance of being rained down upon the cake, so it dribbles down to perfection. Take the time to carefully drip that ganache or frosting down the sides of the cake, then finish off by gently spreading the rest on top. As long as you take the time to create those perfect drips, then you'll have a truly yummy and scrumptious looking drip cake. Finish it off with the topping of your choice, why not tie it in with the flavours of your bake! Chocolate of course is a given, but why not try colourful skittles, sprinkles and smarties for a deliciously vibrant drip cake. We certainly can't get enough of the yummy drip cake, with everyone trying their own scrumptious take on this pretty bake. 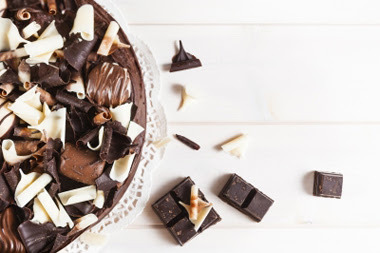 Why not try some of the suggested bakes and bake your own drip cake, alternatively you always spent an hour, or several scrolling through scrumptious drip cakes on Pinterest, I won't blame you if you get more than a little distracted!